Abandoned mines and laboratories in eerie industrial landscapes of Crimea, Moscow’s suburbs and the Murmansk Region are great getaways for those looking at once-forbidden places in the USSR. After the collapse of the USSR, many once-powerful military and scientific sites lost their relevance and were forgotten. The most dangerous and secret ones were immediately shut down and evacuated, but many others were just abandoned. Now some of them have turned into meccas of a sort and somewhat risky “tourist” attractions. 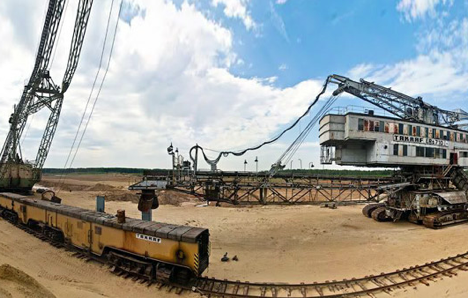 The Lopatinsky phosphate mine, located 56 miles from Moscow, was once the largest in Europe. All of the major types of excavators were used in the pit. This was a gigantic project with its own railway. After 1993 the mine was closed and all of the valuable special equipment was left there. The phosphate mining has led to an unbelievable “unearthly” landscape. The long, deep trenches of the pits are mostly flooded. They are mixed in with high sand ridges that turn into flat table-like surfaces, a sand bed, and black, white, and reddish sand dunes, as well as pine forests with straight rows of planted pines. The gigantic excavators, “absetszers” remind one of alien ships rusting in the sand under an open sky. All this makes the Lopatinsky pit some kind of man-made sanctuary, a place increasingly frequented by tourists. From Moscow to Voskresensk, take an electric train headed towards Ryazan (from Kazansky Station). Then take bus no. 24 Voskresensk-Phosforit from the local bus station (in Voskresensk). The bus departs every 15-20 minutes from 4 am to 10 pm. Once you get to the Phosphorite bus stop, go on foot. In 1953, construction began on a secret anti-nuclear underground facility of the first category (i.e. capable of withstanding the direct hit of a 100 kiloton atom bomb) in the bay of the city of Balaklava (Crimea). The “submarine refuge” was intended to shelter and repair small and medium-sized submarines, as well as to equip them with weaponry. The complex is situated on an area of about 5791.5 square miles. The bedrock above the underground facility reaches a thickness of 413 feet. Up to 14 submarines could fit under the vaults of the refuge at a time. The base was abandoned in 1993, after which local inhabitants dismantled it by nuts and bolts. In 2002 the decision was made to build a museum complex on the ruins of the base. Now the Balaklava military-naval museum complex, which is open to tourists, is located on the former refuge and its adjacent territory. From the Sevastopol bus station, take a shuttle bus to the Market 5 km stop and then take taxi van (marshrutka) number 9 to Balaklava. The museum hours are 10:00 to 15:00 daily, except Mondays. For more detailed information, call +380(692) 63-75-93, 93-31-06. The Kola Superdeep Borehole is the deepest in the world. It has a depth of 7.619 miles. It is located in Murmansk Region, 6 miles to the west of the city Zapolyarny. The borehole was drilled into the northeast part of the Baltic Shield purely scientific reasons in precisely the place where the lower limit of the earth’s crust comes close to the surface of the earth. In its best years, 16 research laboratories were working at the Kola Superdeep Borehole. Many interesting discoveries were made at the borehole, for example, that life on earth appeared 1.5 billion years earlier than previously thought. Researchers found fourteen kinds of fossilized microorganisms in depths at which it was previously believed organisms could not survive – the age of the deepest layers exceeded 2.8 billion years. In 2008 the site was abandoned, the equipment dismantled, and destruction of the building begun. As of 2010 the site had been closed down and was slowly being torn down. However the abandoned borehole with its laboratories has become a kind of a mecca for tourists. There are a number of implausible legends linked to the Kola Superdeep Borehole about it being a “well to hell,” from the depths of which, on some days, it is possible to hear the cries of sinners, and about the drills, melted by hellish flames. From Moscow (Yarolslavsky Station), take the train to the city of Zapolyarny. From Zapolyarny, you need to hire a car (500 roubles or $14). The bore hole is located 6 miles from the city. There is a laboratory complex, residential block, and specialized transformer electro-substation in the Sura complex, along with antennas, radars, and radio transmitters. The formerly secret station, in which some important research is still being conducted, is now thoroughly rusted and battered. But it has not yet been completely abandoned. One of the most important objectives of the research carried out in the complex is developing methods of protecting the work of the technical and communications equipment from various sorts of ionic disturbances in the atmosphere. At present, the station only operates 100 hours per year. As the necessary guards are lacking, scrap “hunters” and thrill-seekers incessantly make their way into the station’s territory. From Moscow (Kursky Station), take the train to Nizhny Novgorod. From Nizhny Novgorod, take a bus from the local bus station to the village of Lisaya Gora (Bald Mountain), and take a ferry from Lisaya Gora to the settlement of Vasilsursk. The Sura installation (Vasilsursk polygon) is located on the outskirts of the settlement and you can get there by making an agreement with local drivers. In the late 1980s, the construction of a huge particle collider was planned in the Soviet Union. The scientific center of Protvino near Moscow, a city of physicists/nuclear scientists, was in those years a large complex of physics institutes that researchers from all over the world came to. An annular tunnel with a length of 13 miles and depth of 197 feet was built. It is still located near Protvino. The authorities even started bringing equipment into the finished tunnel, but at that point a series of political upheavals broke through, and the domestic Hadron Collider was not mounted. The Protvino city institutes maintain the tunnel – an empty, dark ring under the earth – in a satisfactory condition. It has a lighting system and a functioning section of a narrow-gauge railroad track. All sorts of commercial parks from an underground amusement part to a mushroom farm have been proposed. However, the scientists refuse to give the site up yet – perhaps they are hoping for the best. Nevertheless, due to inadequate security, the place has become a very popular place for Moscow visitors to visit. Bus 363 serves as transportation from Moscow to Protvino and back. It departs from the metro station Yuzhnaya in Moscow (exit from the first subway car from the center). The stop is located near the building of the market. The collider is situated within Protvino town limits.